The National Sheriffs' Association is a non-profit organization dedicated to raising the level of professionalism among those in the law enforcement field. NSA is a key player in shaping national policy on critical criminal justice and homeland security issues important to the nation's sheriffs, deputies and police in the halls of Congress, US Courts and at the White House. NSA is lead by an Executive Committee and Board of Directors comprised of members of NSA who are currently holding the elected position of Office of Sheriff. The Executive Committee has supervision, control, and direction of the affairs of the Association and shall be Trustees of the Corporation. The Board of Directors annually reviews the Association's progress and outlines the law enforcement policies that guide the Association's activities. John R. Layton was first elected Marion County Sheriff in November 2010, and was re-elected in 2014. As Sheriff, he has the responsibility of leading the Marion County Sheriff’s Office, which consists of about 1,000 employees; 703 sworn deputies and 300 civilians. The Marion County Sheriff is responsible for the three Marion County jails, which house an average daily population of 2,500 inmates. The Sheriff’s Office is divided into six Divisions; Jail, Criminal, Judicial Enforcement, Reserve, Administrative and Communications Divisions. The Sheriff is also responsible for the management of an annual budget of more than $100 million. Sheriff Layton was born and raised in Indianapolis. He joined the Marion County Sheriff’s Office in February 1974, beginning a career in law enforcement that has spanned four decades and seven Sheriff Administrations. In his early years, Layton worked in the hospital detention ward at Eskenazi (formerly known as Wishard Memorial) Hospital and then spent many years as a road patrol deputy, responding to calls for help and assistance from citizens. Through his tenure he received several promotions and new responsibilities. He became a detective, first working undercover investigating narcotics and vice violations and then sexual and physical abuse. Then-Sheriff Jack Cottey appointed Layton to the rank of Captain and gave him the task of creating and commanding a new investigations unit within the Department. That unit, the Marion County Sheriff Regional Gang and Intelligence would forge new ground by melding computer intelligence analysis and gang investigations. As a result, the unit established ties with the Federal Bureau of Investigation as participants in the Safe Streets Task Force and mount several major gang/organized crime investigations. Sheriff Frank Anderson, upon his election in 2003, selected John Layton to play a key role in his administration, elevating him to the rank of Colonel and Executive Officer and charging him with executing Anderson’s vision of developing the Department as a modern 21st century law enforcement agency. 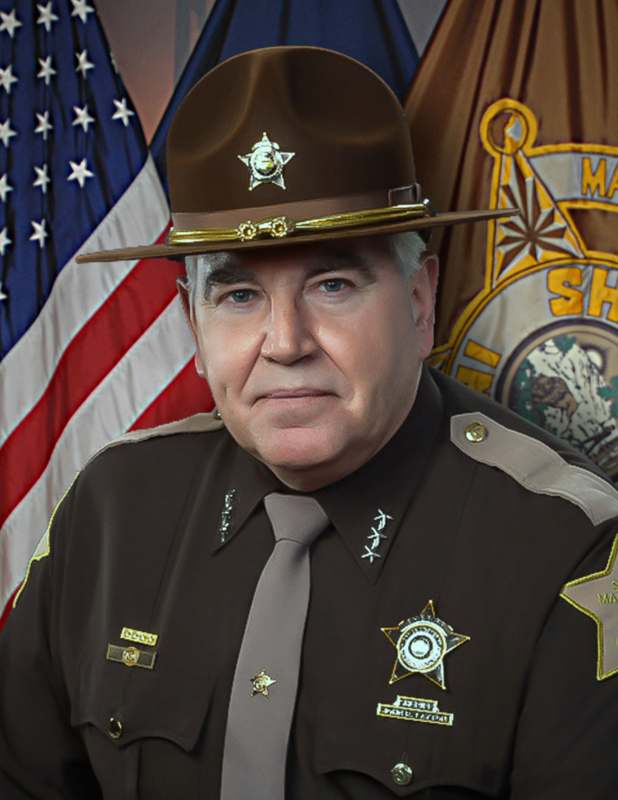 In 2014, Sheriff John Layton was recognized by the Indiana Sheriffs’ Association the “Indiana Sheriff of the Year." Sheriff Layton has been passionately involved in founding the Indiana Sheriffs’ Youth Ranch, located in southwestern Indiana. Purchased with private funds in 2016, the ISYR is set to open during the summer of 2018. Sheriff Layton serves at the President of the Indiana Sheriffs’ Youth Ranch Board of Directors. He has also been a dedicated member and leader in the National Sheriffs’ Association to preserve and enhance the Office of Sheriff. He was elected to the NSA Board in 2012, and will progress to become President of the National Sheriffs’ Association in 2018. Sheriff Layton was a member of the 103rd Class of the National Sheriffs’ Institute, graduating in 2012. He and his wife, Laurie, also a career law enforcement officer, have five children: Kristopher, Nikolas, Natalie, Brittany and Ryan – three law enforcement officers and one firefighter – and ten grandchildren. They reside in the town of Homecroft, an Indianapolis suburb.